Is the Gospel Still to the Jew first? “But all these things, so far as meaning that Gentile Christians are now the truest sort of covenant members, means that Gentile Christians owe the Jews an incalculable debt, cognate indeed with the debt they owe the Messiah himself, the Jew par excellence whose casting away meant reconciliation for the world. And the debt must be discharged in terms of the continuing mission to unbelieving Israel; the very Gentile mission itself has this is one of its sidelong purposes.”-N.T. Wright. I grew up in a large Jewish community here in Columbus, Ohio. The mainline demolition that I was birthed in sat between two Orthodox Jewish synagogues. I attended countless Jewish holiday events, weddings, and numerous Bar Mitzvahs. My daily exposure to Jewish culture continued throughout my youth and into my college years At age 24, I had never before met Jewish people who believed in Yeshua (Jesus). I was invited by a friend to a messianic congregation led by a Jewish believer. For the first time, I heard the powerful and convicting message of salvation taught from the Book of Matthew. So here I was as a nominal Christian hearing the Gospel from a Jewish person who believed Jesus was the Messiah. After coming to faith I started reading and studying the Scriptures. I began to see the pattern of mission in the Bible. The relationship between Israel and the nations has always been something that has been on my mind for the last 15 years or so. I have been involved in outreach efforts to Jewish people and have taught classes on messianic apologetics. But why even care about reaching Jewish people for the Messiah? After all, is not the Gospel for all people? 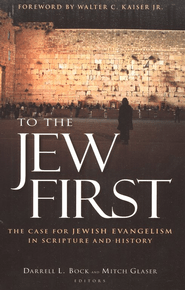 I will offer some reasons why I think the Gospel is still “To the Jew First” (Romans 1:16). First, let’s look at the calling upon Israel: Israel was supposed to have an inward focus in that parents were expected to repeat the stories of deliverance to their children (Ex. 12:24-27; Deut. 6:4-9; Isa. 38:19): “One generation commends your works to another; they tell of your mighty acts. They speak of the glorious splendor of your majesty, and I will meditate on your wonderful works” (Ps. 145:4, 5). The account of God’s goodness was to be passed on from each generation to the next. “Tell your children and grandchildren” (Ex. 10:2) is God’s crucial instruction. Genesis 1-11 is entirely occupied with humanity as a whole, the world of all nations, and with the apparently insoluble problem of their corporate evil. So the story of Israel, which begins in chapter 12, is actually God’s answer to the problem of humanity. All God’s dealings with Israel in particular are to be seen as the pursuit of God’s unfinished business with all nations. Old Testament Israel existed for the sake of the nations.-Christopher Wright, Knowing Jesus Through The Old Testament, Second Edition, pg 46. God called Israel to an ethical distinctiveness (Lev. 11:44, 45; 18:3; Micah 6:6-8). They were to be committed to a holy life, because only in this way could they live to the glory of God and His name, and attract people to Him. In other words, they were called to be a light to the nations. Also, the temple in Jerusalem will be the mega-world center for true worship (Isa. 2:2) and everyone will come there and learn how to worship the true God (Isa. 2:3, 4; 56:2-8; 62:9-11). “This is what the Lord Almighty says: ‘In those days ten men from all languages and nations will take firm hold of one Jew by the hem of his robe and say, “Let us go with you, because we have heard that God is with you” (Zech. 8:23). However, we see at the end of Matthew that Jesus commands his followers to bring the nations into God’s redemptive plan (Matt 28:19). So given that the Messiah is called to be the ideal representative of His people, His mission is also to be a “light to the nations.” We see the following in Isa. 49:1-7: The Servant of the Lord is a chosen instrument by the Lord (1–3). The Servant glorifies the Lord before Israel and brings back the remnant of Israel ( 5–6). He has calling to all the nations (Gentiles). Kings and princes shall see and bow down to the Servant (vs. 7). Yet, for the sake of the glorified name of the Lord, this Servant also suffers (vs 4), being despised and abhorred by Israel (vs 7). In relation to Jesus’ messiahship, while a remnant believed in Him, what is more significant is that Christianity now the home of 1.4 billion adherents. Sure, large numbers don’t make a faith true. But another traditional view is that the Messiah will spread the knowledge of the God of Israel to the surrounding nations (Isa.11:9;40:5;52:8). Are there any other messianic candidates that have enabled the world to come to the knowledge of the one true God other than Jesus? So always remember that the Abrahamic Covenant was prophetic. In this sense, there are several aspects of the covenant such as land promises, etc. But as far as Gentiles, they are supposed to receive spiritual blessings, but ultimately these were fulfilled though one specific “seed” of Abraham—the Messiah. Also, given Israel’s calling it should be no shock that in Ephesians 2: 11-3:6, the Gentiles recipients are addressed as those who were formally without the Messiah. They were “aliens from the commonwealth of Israel, and strangers to the covenants of promise\, having no hope and without God in the world” (Eph. 2: 12). So Israel was already near (Eph. 2:17), but the good news is that now along with Gentiles they even brought closer to God (Eph. 2:18). “If Paul had meant ‘formerly’ or ‘earlier’ he would have used the Greek word “proteron.” The same word for first (proton) is used non-historically three times in Romans: …tribulation and distress for every soul of man who does evil, of the Jew first and also of the Greek, but glory and honor and peace to everyone who does good, to the Jew first and also to the Greek… (Rom. 2:9,10), and First of all (chiefly, NKJ ), that they were entrusted with the oracles of God (Rom. 3:2). After all, we see Paul going to the Jew first in The Book of Acts. Paul goes to the synagogue first in Salamis (13:5), Pisidian Antioch (13:14), Iconium (14:1), Thessalonica (17:2), Berea (17:10), Corinth (18:4) and Ephesus (18:19 and 19:8). Is the Return of Jesus Contingent on the Repentance of Israel? Notice the emphasis on the article “until.” Here, it could not be clearer that Jesus says the Jewish people will not see him again and cry out to Him until there is genuine belief on their part. Here, the word for restoration is “apokatastasis” which is only seen in this text. There is also a similar theme in Acts 1:6 when Jesus is asked about “restoring” the kingdom to Israel. The points is that the Messiah is in heaven and his reappearance to rule and reign can be expedited by Israel’s repentance. Ironically, while the same themes about the condition of Israel and the coming of the Messiah (for the first time) are seen in the Rabbinical literature. What is most interesting in the Talmud of the land of Israel’s picture is that the hope for the Messiah’s coming is further joined to the moral condition of each individual Israelite. Hence, messianic fulfillment was made to depend on the repentance of Israel. The coming of the Messiah depended not on historical action but on moral regeneration.-pg 172. Now this is very interesting! Does moral regeneration sound familiar? As Carl B. Hoch, Jr says in Baker’s Evangelical Dictionary of Theology, “It is absolutely necessary for a person to be born again in order to enter the kingdom of God. In the central passage in the New Testament about the new birth ( John 3 ), Jesus tells Nicodemus, a member of the Jewish ruling council, that he will not enter the kingdom of God unless he is born anew. The alternation between singular and plural Greek pronouns in the passage shows that Jesus is speaking to Nicodemus both personally and representatively. The need for the new birth is not only true of Nicodemus, but of the entire Sanhedrin, all Jews, and, by extension, all people. THE NEW BIRTH allows us to have the supernatural cleansing from sin that God through the Spirit effects on all who believe on his Son. This water-Spirit combination is a reflection of Ezekiel 11, 36, and Jeremiah 31. In these Old Testament passages God’s Spirit is viewed as doing a revolutionary work in the lives of God’s people in the new covenant age. a. The Church doesn’t read not teach the Bible left to right. In other words, most Christians are discipled by reading the New Testament first and then they might eventually get the what they call “The Old Testament” which really translates as some outdated, or inferior book. This is tragic given Jesus and Paul grew up reading the Tanakh (The Hebrew Bible). Hence, there was no New Testament at that time. So when Christians read the Bible this way, they tend to not see the unity of the Bible. This needs to be corrected. b. The Church tends to view Israel as something that only matters in their eschatology (the study of end-time events). For many Christians, when they think of Jesus, they see no relationship between Jesus and Israel. The only thing that seems to matter is getting “saved” and asking whether one is on their way to heaven or hell. This is tragic because it misses the mark on the entire Biblical narrative.The first step in restoring a correct understanding is to understand the role of Israel’s election in the Bible. Now I can almost anticipate that any mention of election conjures up Calvinist thinking and whether one is considered one of the ‘elect’ or not. But that’s not what we are talking about here. Christians need to remember that Israel is about a people group, not just a piece of a puzzle in some future eschatological drama. In other words, Jewish people are just like anyone else. They need to hear about their Messiah and place their faith in him. c. Anti-Semitism: As much as I won’t’ spend time calling any Christian anti-Semitic, the reality is that it is still alive in the Church. d. A misunderstanding of the relationship between Jesus and the Pharisees. Sure, Jesus was hard on the Pharisees. But do we really understand the issue of polemics in that time period? It seems like the Pharisees are the beating ground for so many Christians. Not to mention it is the misreading of the relationship between Jesus and the Pharisees that has laid the groundwork for anti-Semitism in the Church. If you can get access to it, try reading the article called The New Testament’s Anti-Semitic Slander and the Convention of Ancient Polemic by Luke Timothy Johnson. It may change your perspective a bit on this topic. e. Many Christians assume Jewish people are so hard to reach for the Messiah! No duh. Just read the prophets! God told some of them to go and speak to the Jewish people. And he told them they would be rejected ahead of time. The best thing to do with any Jewish person is to build relationships of trust. Never assume anything. Always follow the example of our Lord by asking questions. And always remember that all Jewish people come to faith just like anyone else. They must be open to the truth and God’s Spirit must open their eyes (2 Cor.4:4-6). Over the last several years I have taken a direct approach to talk to Jewish people on a large college campus. I have spoken to many, many, Jewish people. You would be surprised how many Jewish people have never heard one clear presentation as to why Jesus is the Jewish Messiah. So my question is the following: Does your church do anything to support Jewish missions? Does your church ever talk about the issues I just mentioned? If the Gospel is still “to the Jew first” can the Church be obedient to the pattern of mission in the Bible and ignore some sort of visible outreach to Jewish people? Next Article Are You Suffering From Apologetic Burnout?